Under $1.75 per serving. 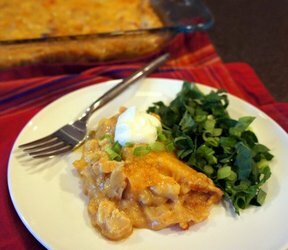 These creamy enchiladas, stuffed with chicken, onion, bell pepper strips and green chiles and topped with melted cheese, will turn dinner into a Mexican fiesta. 1. Preheat oven to 325° F. Stir Sauce Mix and milk in medium saucepan. Stirring constantly, cook on medium heat 5 minutes or until thickened. Stir in sour cream and chiles; set aside. 2. Heat 1 tablespoon of the oil in large skillet on medium heat. Add chicken; cook and stir 3 minutes or until lightly browned. Remove from skillet. Add remaining 1 tablespoon oil to skillet. Add onion and bell pepper; cook and stir 10 minutes or until tender. Return chicken to skillet. Stir in 1/2 cup of the sauce. 3. Spread 1/2 cup of sauce in lightly greased 13x9-inch baking dish. Heat tortillas as directed on package. 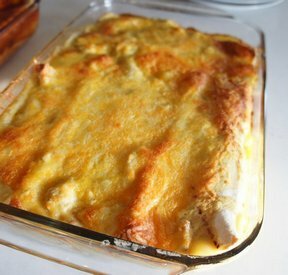 Divide the chicken mixture evenly among each tortilla. Fold over tortillas sides; place seam-side down in baking dish. 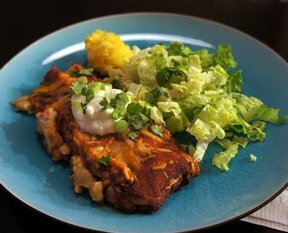 Pour remaining sauce over enchiladas. Sprinkle with cheese. 4. Bake 40 minutes or until heated through and cheese is melted.